For use as a grout: for most ceramic, porcelain, and quarry tiles, acid-resistant floor brick, pavers, and natural-stone tile (*Note: Marble, granite and slate are products of nature made from a vast combination of minerals and chemicals that may cause the material to behave or react in a manner beyond our control. Likewise, we do not have control over any of the materials or processes used in the manufacturing of agglomerates. Therefore, determine the suitability of all the materials before proceeding with the installation. To ensure desired results, a mockup installation is required before the actual installation.). For grout joints widths 1/16" to 3/8"
Note: Some glazed ceramic tiles, marble, granite, and marble agglomerates can be permanently stained, scratched, dulled or damaged when grouted with pigmented, sanded and epoxy grout formulas. See manufacturer''s literature and test before grouting. Mortar Limitations: do not install over substrates containing asbestos; do not exceed 1/4" in epoxy mortar thickness under the tile; do not apply over particle board, presswood, oriented strand board, Masonite, chipboard, Luauan, gypsum floor patching compounds or similar dimensionally unstable substrates. Hello, If we order this product, what is the estimated delivery time? Is there a way to rush the order? Thank you. Mapei® Kerapoxy® Epoxy Grout and Mortar is premium grade, chemical-resistant non-sagging grout and a water-cleanable, 100% solids, high-strength epoxy mortar. Great for use on counter-tops, high traffic areas, and areas needing chemical and stain resistance. I had never used epoxy grout before and was very hesitant but it was very easy to use if you follow the directions. It was about 70 degrees and I had plenty of work time before the Kerapoxy set. Would highly recommend this product for any application that calls for epoxy grout or mortar. Thank you for your review. 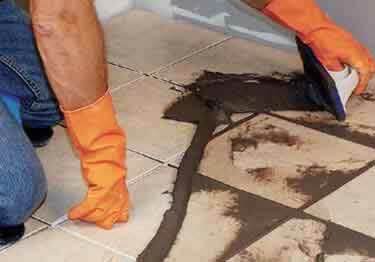 We very much appreciate your nice comments about the ease of use and the quality of our Kerapoxy Grout. If you ever have any questions down the road always feel free to give us a call. worked out great for the application we were looking for.